This post was first written in Sep 2015 and last updated in July 2018. This article contains affiliate links. When considering a Southeast Asia trip you will be forgiven for not thinking of the possibility of traveling to Brunei. The tiniest country in the region, it is also one of the least visited. But despite its small size, there are enough things to do in Brunei to keep you busy for at least two to three days, just like I did. If you are wondering what to do in Brunei, you have come to the right place. Having planned the trip ahead and done quite a bit of research on all the attractions, I put together a packed itinerary for three days of travel to Brunei with all the best highlights. I went out to the tropical rainforests jungle (the best preserved in Asia), up the canopy top, down rivers, on firefly boat trips and even to the Royal Palace to meet the Royal Family! If you are planing to travel to Brunei, I would recommend budgeting for three days, but if you only have a weekend, you can still cover most of the best things to do in Brunei by squeezing them in and organising your schedule ahead of time. Planning can do wonders here. Brunei, known in Malay as Brunei Darussalam or “The Abode of Peace”, is a small country entirely surrounded by Malaysia and the South China Sea and made of two separate areas. It is the only country fully located on the island of Borneo. The majority of the population lives in the Eastern part of the country, where the international airport and the capital of Brunei, Bandar Seri Begawan, are located. The Western part of the country only accounts for 10% of the 400,000 Bruneians and is entirely made of lush and pristine jungle, the best preserved in Asia and not connected to the Eastern part but surrounded entirely by water or Malaysia. The most famous park in this part of Brunei is the beautiful Ulu Temburong, home to several endemic species including the very shy Proboscis monkey, which you can also find in nearby Sabah State and Kota Kinabalu Park in East Malaysia. A visit to the park is one of the main reasons to travel to Brunei and worthwhile even if you don’t do anything else. While you may have never heard of Brunei before, the country is most famous for the eccentricities and excesses of the Sultan, once the richest man in the world, and one of the last remaining absolute Monarchs. Sultan Bolkiah, whose full name is Sultan Haji Hassanal Bolkiah Mu’izzaddin Waddaulah ibni Al-Marhum Sultan Haji Omar Ali Saifuddien Sa’adul Khairi Waddien is estimated to have accumulated a fortune amounting to $20 billion thanks to vast natural reserves of oil and gas. He also regularly makes the headlines for his indulgences in custom-built high-performance cars and lavish homes. The Royal Palace, Istana Nurul, is the world’s largest palace and family residence. Open to the public only during the three days after the end of Ramadan, the Palace is said to have almost 1,800 rooms and over 200 bathrooms. There is a garage for one hundred luxury cars, the Sultan’s favorite selection over the seven thousand car collection he is believed to have amassed. Despite being known for his wealth and extravagances, the Sultan introduced Sharia Law, the most conservative form of Islamic Law, in 2014, to much international dismay. Rolled out in phases, once full Sharia Law is implemented, punishments as primitive as flogging, stoning to death and cutting of limbs will be imposed in Brunei. As a visitor, you can roam freely and safely, for the Sultan’s generosity with his people and the country’s limited freedom of expression makes this a peaceful country. Here is my article on the best facts about Brunei if you want to learn more before you go. I visited Brunei with a friend at the end of Ramadan and during the celebration of Hari Raya Aidilfitri and had the chance to enjoy some of the best things to do in Brunei. Check the list below and the map to locate where they all are. Brunei appears to most as a place devoid of any interesting sights. However, this is a country where you should find beauty in the smallest things and where experiencing the place, rather than ticking things off a checklist, is what matters most. There is no party or dancing in the country, for it is a strict follower of Islam and alcohol is forbidden. As a result, when the sun sets, there is little more to do in Brunei than go on boat tours to spot fireflies or sit at a cafe with a slice of cake. The Museum of Brunei is a great source of information about the culture and history of the country, including the recent developments in the oil and gas industry. The Sultanate of Brunei was a strong Empire up until the 15th century when wars and disputes caused its decline. For most of the time after that, the country remained under various forms of protection from the UK until achieving full independence in 1984. While a visit to a museum about a country’s history may not be everyone’s definition of the best places to see, I do believe it makes sense to start your visit to Brunei here so that you have a good understanding of this tiny country. Some of Brunei’s attractions you will explore later will make much more sense after you are able to link them to the country’s interesting and fascinating past. More information about the Museum can be found here. Yes, this is another museum and it could be as interesting or mind-numbing as the Museum of Brunei, but it may give you ideas for that Aladdin-like gift that you are thinking of buying a friend who has it all. After all, I cannot think of a better place to dream of 1,001 Nights than Brunei where the Sultan wears suits made of gold and precious stones. Consider this more than just a museum and walk in to be amazed, I promise this is one of the most interesting places to see in Brunei. The Museum is home to the Sultan’s life including all the objects that are part of his reign. Replicas of his throne, the gifts that Royals and Heads of State have given the Sultan, crowns and gowns. Expect gold and jewels galore, like you have never seen before. The entire place is reminiscent of the Armory, in Moscow’s Kremlin, where the Tsar’s richeses are displayed. The museum is located in the downtown part of Bandar Seri Begawan near the famous mosque, you can’t miss it. Entrance to the museum is free and you will have to leave your belonging and cameras at the entrance. You cannot visit Brunei and not see its most famous tourist attraction: Masjid Omar Ali Saifuddien. 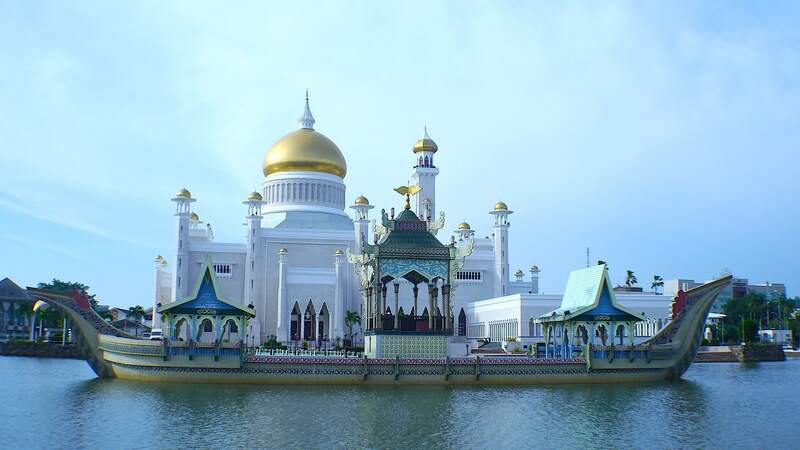 It is also an impossible-to-miss landmark in Brunei since it sits tall and surrounded by a lake right in the center of the capital city and it is the tallest building at 52m high. The Mosque, built in honor of the Sultan’s late father, the 28th Sultan of Brunei, in 1958 is made of solid gold and fine marvel from Italy and was inspired by India’s Mughal architecture. It does remind a lot of some of the constructions in India like the Taj Mahal. The mosque was the first official and large mosque to be built in the capital city. Prior to that, there used to be a much smaller wooden mosque in the same area but it was not able to hold more than 500 people, so massive prayers for marked dates were held out in the open. The crescent lake between the mosque and the water village, Kampong Ayer, gives it a heavenly aura. Watch out for monitor lizards cooling down in the water to avoid being surprised when taking a picture. The large and colorful barge in front of the mosque is a replica of the 16th-century Royal Barge and was built almost a decade after the mosque completion. The barge used to stage Al-Quran reading competitions. Although the mosque is open to visitors and entrance is free, this is a functioning house of prayer so practice respect at all times. If you are not muslim, you may not be allowed inside at times of prayer of special dates like Ramadan or Eid Al Fitr. Women should expect to cover their heads, men may be turned away if wearing short sleeves, vests or shorts. There is an elevator going to the top of one of minarets for the best views of the city. One of the most interesting things to do in Brunei is renting a boat from the harbour to motor through the world’s largest water village with 30,000 people and the mangrove area around it. You should do this both at night and during the day as the experiences are different. Kampong Ayer, the water village, is a mere few minutes from the shore on the main area and can be accessed by simply renting the boat and skipper for a few dollars (I believe we rented it for a couple of hours for $10). Negotiate with the boatman before getting on the boat. These are not tourist boats, there are very few visitors in Brunei, but rather the same boats the locals use to get around. Some may not have a roof to protect from the sun so be sure to pick the right one or bring a hat, the sun is Brunei is brutal. Firstly, head out to the mangrove area where you can spot proboscis monkeys. These monkeys, endemic of Borneo, are shy and will fly away if bothered or startled but, with the right pair of camera lenses or binoculars, you may be able to see their funny noses. On your way back, ask the captain to drop you off at Kampong Ayer and wander along the suspended streets, this is one of the best things to see in Brunei. You will have to take another boat to get back but there are regular water taxi style boats from the main piers on the village. People are friendly and you may be able to, respectfully, peek inside people’s homes and see how a village entirely above the water works. Contrary to what you may see in more impoverished parts of Asia, Kampong Ayer is a developed and wealthy part of Brunei. Some of the newer houses are as good, if not better, than the ones on land and can go for as much as $100,000. It is fascinating to see how so many people live on stilts. A stroll along the Kampong Ayer bridges and paths is one of the most fascinating things to do in Brunei. What to do in Brunei at night? You will surely be wondering that on the first night you spend in the country as you will quickly realise everything is closed and this is the quietest capital in Asia. Well, I have a suggestion for you. Go chase fireflies. No, really. While the visit to the kampong and the proboscis monkeys needs to be done during the day, you should also return to the mangroves at night. If you go there at night you will also be able to see the red eyes of crocodiles resting on the shore and the blinking light of fireflies. As opposed to the rest of Borneo, where logging and palm oil plantations are the source of much concern from environmental agencies and the public in general, Brunei’s jungle is virgin and one of the best places to visit in Brunei. Logging is banned, providing a unique insight into an unspoiled eco-system of overgrown vegetation and thick forestry. Birds chirp away, monkeys jump from tree ropes and eye-catching plants attract visitors to long hikes. A trip to Ulu Temburong National Park is a must do when in the country. You will have to book with a tour company because independent visitors to the park are not allowed but this is Brunei’s best tourist attraction. Only about 1% of the park is open to the public whereas the rest remains closed off and only accessible to researchers and park personnel. Aside from the possibility to spend some time with nature, Ulu Temburong is primarily known for the canopy walk, a suspended structure hanging high atop the jungle which you can climb up to for the best 360 degree views of thick jungles. You have to take a boat, a van and a long-tail boat to get there from the capital. If the tide is low you may have to get out of the long tail boat and push at times. Once you arrive at Ulu Ulu the real trekking begins. You will have to walk up 1,000 steps in hot and humid weather but the reward at the top of the hill is all worth it. 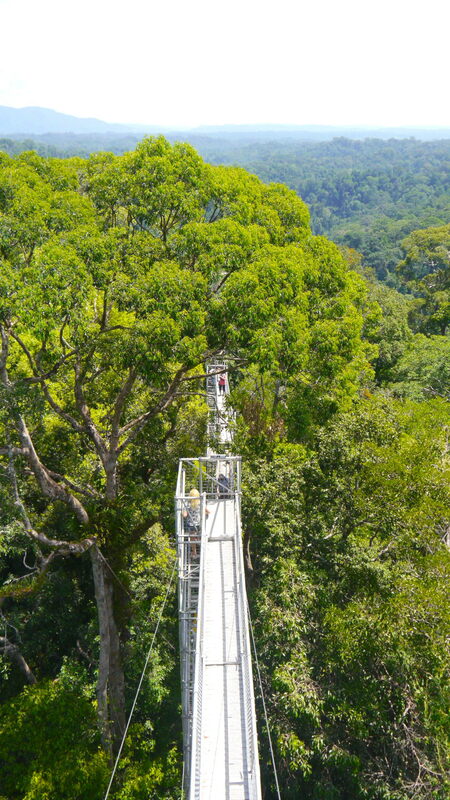 Built in steel and standing high at sixty meters, the canopy walk provides an incredible view over the jungle top, if you can bear the altitude and the scary rattling of the structure as you climb up. This is what Borneo would be everywhere else if the palm oil industry had not arrived so head out to Brunei for a glimpse of untouched, wild nature. Most people do not seem to pay any attention to this but Brunei is located on Borneo, where some of the best diving spots in Southeast Asia are so and other pristine islands, is diving one of the best things to do in Brunei? The answer seems to be a rotund yes. Yet most people visiting Brunei seem to forget its underwater attractions. Wondering what to do in Brunei to get in the water? Diving seems like a pretty good excuse. Now let’s be realistic, don’t go expecting diving like in neighbouring Sipadan, this is not a place to see schools of barracuda or large fish. You should also not expect fabulous beaches, the beaches in Brunei leave a lot to be desired and the sea conditions can be rough, but if you are into macro diving or want to head out for some WWII wreck sites the you should add this to your Brunei list of attractions. This is perhaps Southeast Asia’s best kept diving destination. Check out Oceanic Quest for more information about diving in Brunei. This is one of the most bizarre and unique food items I have ever eaten and it is Brunei’s most famous dish. Made of a glutinous sago pudding that is eaten when the thick and elastic porridge is rolled around the fork. The point is to then dip the rather bland concoction into spicy meat with chilli sauce. It is a bit strange at fist because of its chewing gum, gooey texture that is probably not everyone’s cup of tea, but quite tasty and unique. You should definitively try it. Maybe make it a dinner outing to turn it into a great evening activity in Brunei. Ambuyat usually is served with sides of cucumber and vegetables already so don’t over order. For an extra dose of genuine, head out to the famous Aminah Arif restaurants which is know to serve this. It can get quite busy in the evenings so go early. Families come here in groups for their weekend outing so after being presented with the menu, we simply looked around and found the dishes that looked most appetising and added them when ordering. Bruneian food is mostly similar to Malay so the rest of the dishes were familiar to someone who lives in Singapore for a long time. Built in 1992 Jame’Asr Hassanil Bolkiah Mosque is the best expression of utter exuberance and Royal extravaganza in Brunei. It is, of course, filled with more gold, and because the Sultan is the 29th reigning Monarch in his dynasty, there are 29 golden domes, because one is not enough. At night, when it is lit, it is impossible to miss. It stands bright and tall in the surroundings. The mosque is the largest in the country and can accommodate 5,000 worshippers. It is not located in the city center like the other large mosque, so getting there is a bit trickier and you would be better off joining a tour. The building is impressive and well worth a stop so you could try to sneak a stop on either your way from or to the airport. Getting inside is not always possible to visitors and non-Muslims may not be able to get in during prayer times. But seeing it form the outside is great too. Once Southeast Asia’s most expensive amusement parks, this is as kitsch as parks can get. Costing $1 Bn to build, the park was entirely funded by the Royal Family. When it opened, it became known for the various concerts performed by singers of international acclaim such as Michael Jackson or Whitney Houston. Although it originally opened without an entrance fee, it later started charging when the visitor numbers declined. Today, several of the attractions have been closed and sold off and it is now a decrepit place that is busy on weekends with families having a picnic. The entrance is free and you pay to use the rides. Not sure they are completely safe. Could be an interesting place to see. The park only opens in the afternoon/evening as it would be too hot during the day. This is the world’s most impressive royal building and considered the largest palace in the world with over 1,800 rooms. If you are in the country at the right time of the year, you should not miss the chance of visiting as this is one of the best things to do in Brunei. But there is a catch. Nurul Istana is not open to the public except for the three days of Eid at Fitr at the end of the month of Ramadan so, if you can time your visit to Brunei to these days you will be amazed by the building and the incredible experience that it is to meet the Sultan or his wife. I did, as I made sure to visit Brunei during Eid and it was quite a remarkable experience. Nurul Istana is a huge complex and as such, it can accommodate huge amounts of people. During Eid, the Sultan and his wife will meet and greet every single person who queues up to do so. That includes foreigners. And so my friend and I queued up in the hopes of making it on time. Queues can be really hard, and we had to wait for almost three hours to shake hands, but it was worth it as the experience was quite fascinating. Firstly, you need to head to the Royal Palace, we took a taxi. Then, you will first enter a huge banquet hall where celebratory food is served. You can eat as much as you like, all the food is free and offered by the royal family to the visitors. There are all sorts of foods on offer including all sorts of sweets and fruits. Eat your heart’s content and then head to the next rooms (follow the crowds or ask) to start the queue. The queuing system is organised and peaceful. You will be moving through various halls and rooms, all incredibly decorated in gold and yellow, and some of them will host performances, music and dancers to entertain the visitors while they wait. You will not wait around in a line but rather in rows of seats. Every few minutes, an entire row will be called to move to the next room. It is hard to tell how much longer you have to wait as, until you reach the outdoor patios and courtyards, you can’t really see the end of the line. Eventually, you will leave the indoor areas and head outside to an interior courtyard with pillars and fountains and you will be able to tell the end of the line is near. When it is your turn, you will have to leave your cameras and belonging in an area and take your shoes off. Women will meet the Sultan’s wife while men will meet the Sultan himself. As we were the only clearly foreign people in the line, when it was our turn, the Sultan’s wife even asked us where we were from. At the exit, make sure to collect your gift: a signed greeting card from the Sultan for Eid and a heavy fruit cake inside a yellow metal box with the Sultan’s face on it. Great souvenir to take home! I absolutely love night markets and the one in Brunei is just fabulous. This is an explosion of food and smells that fills the air. if you are visiting Brunei you just cannot miss this market. As there are not a lot of things to do in Brunei at night, this is just another great way to fill your evening, albeit don’t expect it to go until midnight. Head there when the sun sets and wander the alleys picking food here and there to try them out. People are friendly and because you can see how the food is made this also doubles up as a great attraction in Brunei, even if you end up going elsewhere to eat. Food markets are the perfect way to get under the skin of a country and understand more about its food culture. There are not a lot of options for hotels in Brunei and given the lack of public transportation and availability of taxis, I would highly recommend staying somewhere in the central area so that you can walk to the main attractions and points of interest in Brunei. For lack of a better option, I walked to the night market and it was well over an hour’s walk. The entire Brunei only has one four star hotel and one five star hotel and they are both very different options. Choosing where to stay in Brunei is therefore a pretty straightforward decision. This is the hotel I recommend the most and where I stayed. It is a reasonably prices four star hotel right in the central part of the city. It is not fancy in any way but it is the best located hotel in Brunei. They also have a tour desk that can help organise the trip to Ulu Temburong and even taxis, although they are largely inexistent in the country. This is much the opposite of the Radisson Hotel. It is very far from the city center and located by the sea, near a golf course. This is probably the only weekend getaway for the locals and for the many oil workers and expats living in Brunei. The hotel is old world charm, with red velvet, draped curtains and indoor swimming pools. If you did not know you were in Brunei you could think you are in the English countryside. The Empire Hotel is located in expansive grounds with plenty of green. There is even a beach to sunbathe, the only one in Brunei. You will however be located far from the city so you will need to hire drivers for the day to go explore. If you want a beach getaway with a twist in probably the least likely countries in Asia this is probably it. Brunei is a pretty unique country and so some of the things you would expect from its neighbours or other countries in Asia do not apply. It is best to pay attention to some of the travel tips to Brunei below. As I mentioned a few times, public transportation in Brunei is almost inexistent and there are very few taxis. As a result, I found myself having to walk incredible distances at night because there was no other way to get back. It would be wise to get the hotel to organise a cab for you who can also come back to pick you up if you are going off from the city center, like when visiting the night market. We found the locals actually stopped by to offer us a ride, but being cautious as two women traveling alone, we decided to decline. It was quite a common act of kindness. Brunei is a dry country. That means that alcohol is forbidden and not available anywhere. You will not find onboard the planes from Royal Air Brunei and you will not see it anywhere. There is also no party and very few businesses stay open past 10pm. So there isn’t much to do at night save for the firefly mangrove tours I mentioned. This is also one of the reasons why most people will tell you that traveling to Brunei is boring or not worth it. I still found it a fascinating country, interesting and unique if indeed not an “exciting” destination per se. If you want to bring your own alcohol for your own consumption (not for selling) you can do so with a maximum of 2l per person which needs to be declared at customs. 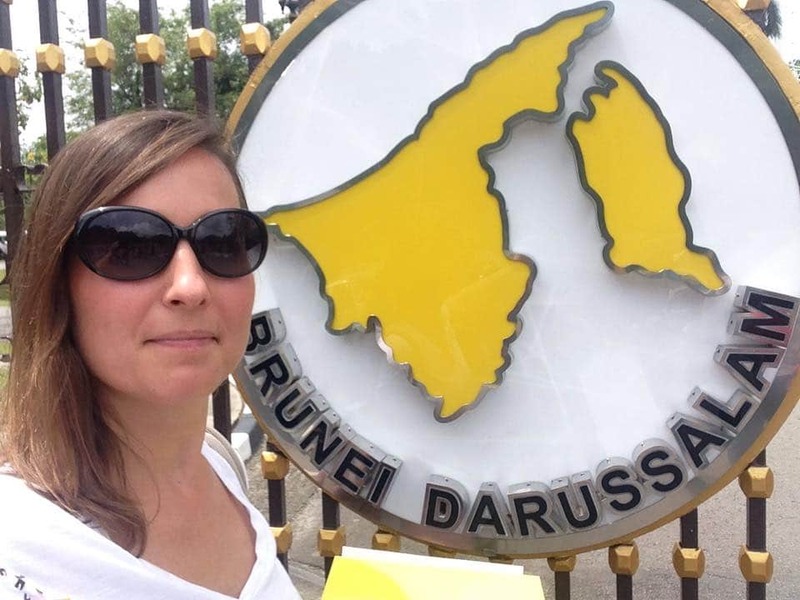 Sharia Law was imposed a few years ago in Brunei and as a result, most women cover their heads and locals will wear long sleeves and long trousers, despite the weather would call for shorts. You are best respecting the local customs and wearing long trousers too but, as a woman, you are not expected to cover up. Bring a scarf in case you can visit the mosques. Although Brunei has its own currency, both Singapore dollars and Brunei dollars are accepted and your Brunei dollars will also be useful in Singapore so if you are visiting the tiny Red Dot city after or before Brunei keep your dollars and use them there, for example, enjoying one of these 100 things to do in Singapore or staying at one of its many Luxury hotels. The main airport is the one in the capital Bandar Seri Begawan and is the most relevant way to get to Brunei. There are international flights into Brunei from Singapore and Kuala Lumpur, the two closest cities and, via Royal Brunei Airlines, there are flights to a number of other international destinations. Royal Brunei Airlines tends to have affordable tickets and it is a full fledged one and a decent one though. However, another common way to arrive is by crossing the border by road from Miri where the British Army training camps are and the majority of the oil expats live. They escape the even more remote and boring city of Miri and come to the country for the weekend looking for some more exciting things to do in Brunei.